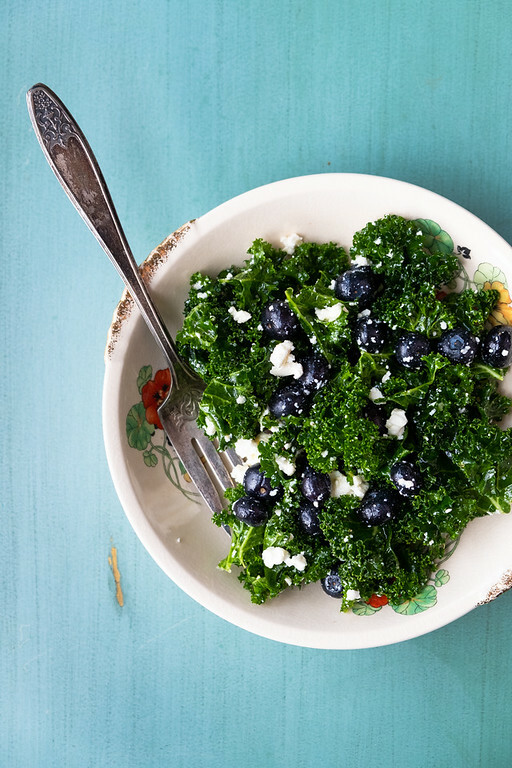 Crisp tender kale, sweet blueberries and tangy feta cheese make a delicious kale salad! You’ll love how easy it is to make this healthy salad, perfect as a side dish or a light lunch! Have you jumped on the kale salad bandwagon? We have here at the Sidewalk Shoes household. We have them every week! The crazy thing is I haven’t been posting my kale salad recipes! What’s up with that?! Well, don’t worry, I started taking notes and taking photos and I’ll be sharing lots more kale salads with you in the future! I love kale salads because I can make enough to have leftovers the next day for lunch. A regular salad becomes limp and unappetizing, but a kale salad is still yummy the next day! 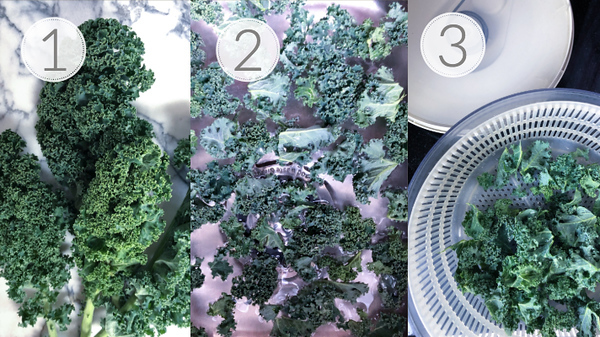 Step 1 and 2 – Strip the leaves off the kale and place in a sink of water. Tip for cleaning kale – I like to tear it into bite sized pieces at this point because it makes it easier to clean. Swish the pieces around in the water, being sure to get in all the little crevices. Step 4 – place kale leaves in a bowl, big enough that you can get in and massage the kale. 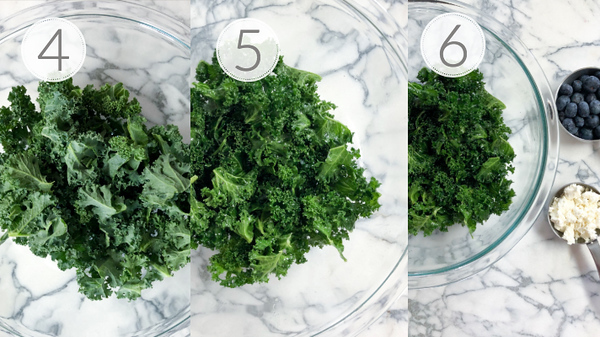 How to Tenderize Kale – the secret to a good kale salad is a little massage. After you pour your dressing over the kale, get in there with you hands and gently squeeze and massage the kale. A couple of minutes is all it takes. You can feel the kale soften in your hands. Step 6 – add the blueberries and feta cheese to the salad. Taste and adjust the seasonings. This healthy kale salad is so good! We have it several times a month, especially during blueberry season. Though, I have a stash of blueberries in the freezer, so we’ll be having this year round. The kale is tender with still a little chew, the berries are sweet and bursting with flavor, the feta cheese adds a lovely tang, and it’s all pulled together with a homemade lemon vinaigrette! Kale salads will keep about 3 days in the fridge if stored in an air tight container. Besides being delicious, this salad is also incredibly healthy. According to Healthline, kale is one of the most nutrition-dense foods on the planet. You can read more about the 10 Health Benefits of Kale. If you want even more salads, be sure and follow my Salads Board on Pinterest. 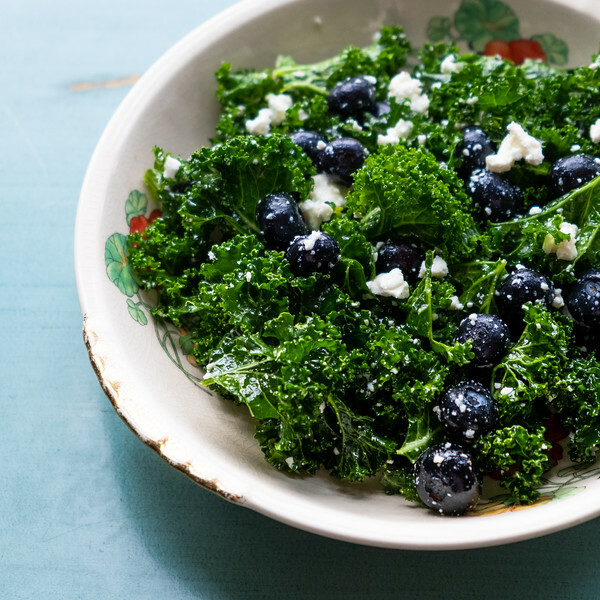 Tender kale, sweet blueberries and tangy feta cheese make a salad that is healthy and delicious! Remove kale leaves from the stem and tear into bite sized pieces. Submerge in water and swish around until clean. Spin dry or use a colander to shake off the water. Add kale to a large bowl and pour over half of the lemon vinaigrette recipe. Massage gently with your hands for a couple of minutes or until the kale is as tender as you like it. Add the blueberries and the feta cheese and toss to combine. Taste and adjust the seasonings. Tip for cleaning kale - I like to tear it into bite sized pieces at this point because it makes it easier to clean. Swish the pieces around in the water, being sure to get in all the little crevices. How to Tenderize Kale - the secret to a good kale salad is a little massage. After you pour your dressing over the kale, get in there with you hands and gently squeeze and massage the kale. A couple of minutes is all it takes. You can feel the kale soften in your hands. I’m not a fan of kale, because I find the edges of the leaves to be rough. But I bet this would suit me wonderfully with spinach! Such a refreshing salad! Yummy!! Love the creativity of adding the blueberries. They may not show up against the green of the kale visually, but they sure show up in flavor, texture, and nutrition! Yes, they do add such a nice sweetness to the kale salad! I love kale salads! This one is a must make! I love this idea! I am a huge fan of kale, but have never thought to put blueberries with it before. Must try soon! It’s so good, I love adding fruit to kale salads! I’ve never been a fan of kale but I’ll give this recipe a try. As always its looks so beautiful – great depth of colour. Yes, give it a try. We are totally hooked on kale salads!